Does an artist know the skills of artistry/craftsmanship? Can an artist make a greater masterpiece than himself/herself? Is an artist and art the same thing? Or are they two separate entities? They will probably answer those questions as follows: Of course, an artist knows his/her skill. A carpenter who designs a table will know a table and a painter will know a picture and will paint accordingly. An artist can never make a greater masterpiece than himself/herself. No matter how perfectly he/she designs a computer, it is extremely primitive in comparison to his/her brain. Or, no matter how perfectly he/she constructs a house, it is artistically lacking when compared to the artist’s own body. As for the issue whether the artist and the work of art are the same or not, they are, of course, different. The carpenter is different from the table and the painter is different from the painting. The artist knows his/her craft. An artist cannot produce a greater work than himself/herself. The artist and art are two separate things. Oh, the person who denies God, Listen! By denying God Almighty, you are making nature and its causes the artist of materials. Yet, you have just said: “The artist must know their craft”. However, the things that you accredit as being the artist, which are water, the sun, soil, air, and other causes, do not have any sense of self, let alone a sense of material. In that case, how could they create these works of art? Do not forget that you accepted the rule, “the artist must know his/her craft” as well. You also said, “an artist cannot create a greater masterpiece than himself/herself”. However, even a fly is more artful and excellent than those causes. Just raise your head and look at the universe. How can you claim that these miracles of art have formed by simple, artless, and unconscious causes? Besides, the artist and art are two separate entities. However, by identifying these causes as the agents, you claim that the artist and art are the same. When we previously asked, “Who created these articles?”, you answered “nature”. Now you are identifying the same articles as nature. In this case, these articles are considered as nature and they are considered to be created by nature. However, it is not possible for something to be both something created and the creator. 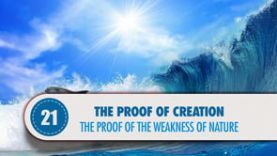 You identified these articles as being both created things and the creator. If you are referring to someone else by saying “nature”, we do not refer to Him as “nature but as “God”. You too, should say God and save yourself!